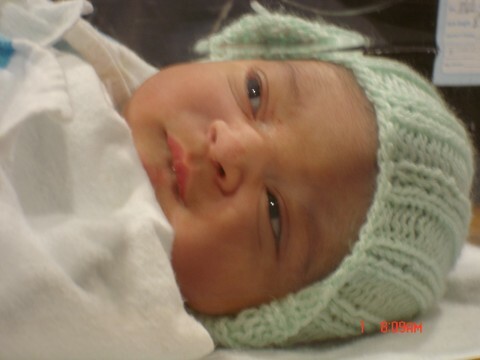 Puran Singh ("Master P," as my brother is already calling him) was born yesterday at 8pm. He's 8 pounds, 2 ounces (3.7 Kg), and both he and his mother are doing well. We have lots of family around helping us out and giving support (thanks, everyone), and the hospital experience has been pretty good, though the final stage of labor was difficult (I guess it always is). The name means "fulfillment," "completion," or "perfection." No one in our family has been named "Puran," but there are a couple of famous people who have had this name: including Bhagat Puran Singh and also a famous Punjabi poet. In the Sikh tradition, the first letter of a baby's name is usually chosen by opening the Guru Granth Sahib at random, and taking a "Vakh." The first letter of the page opened is supposed to be the first letter of the baby's name. In our case, we got "P," and I immediately thought of "Puran." Heartiest congrats to the proud parents and love and blessings to Baby P who may look forward to the unique privilege of growing up before the electronic eyes of the fans of his dad's blog! All best and happy parenting. All good wishes and blessings to mother, father and son. He's beautiful! Congratulations again to you and your wife! He's so adorable Amardeep, and Puran is a good name for him. Congratulations to you and your wife, and many blessings to all of you. Jeenday raho! Hope to see him blogging before he speaks. congratulations to you both! he's a cutie. Awww... he's gorgeous. Enjoy parenthood!!! Congratulations, Amardeep! Best wishes to you and the entire family. How does it feel to be a dad! The reason I am asking is because I am going to be a dad in March next year as well! So cute, Deep. Congrats to both of you! Congratulations Amar and welcome home Puran ! I had no idea he was on his way! Congratulations! Awww, he's so cute! Congratulations, Amardeep, and my best wishes to your family! Lovely little bundle with a lovelier name! Congratulations Amardeep and great name. Hey, that's how I was named too: bibliomancy. My mother just opened the book of baby names and put down her finger and that's what came up. Congrats and mazeltov Deep! A blessing. I thank Puran's mother, Puran, and you for reminding us that the world should go on, and for sharing your hope and love. May the ripples of your joy spread far and wide, and return to you and yours. May love and all tender emotions outlast these times of strife. Congratulations and all the best; this is one new edition you're never going to tire of, yes? Kamaal kar ditta Amardeep BHa! You have now become "pura" or complete. The little angel is so cute! Puran is not a name one gets to hear very often these days. So I congratulate you doubly. Of course, one harks back to the legend of Puran Bhagat - he incidentally was not a Singh - to the finest Punjabi poet of the 20th century, Prof Puran Singh, and to the incredible social worker from Amritsar, Bhagat Puran Singh who ran a PiNgalwaRa - a free home for the lepers, destitutes and ostracised. His work, though not as extensively written about as Mother Teresa's, is as great. taking him/her to newer dawns. पूरन भगत को आशीष ! Aap kya Shabnam Hashmi ke group se sambandhit ho? Congatulations Deep! Puran means a moment of perfection and purity in Turkish. I wish him a long and healthy life. I somehow managed to miss this wonderful event--many congratulations! He is beautiful. I love P names my baby name is Phiny.